For years I’ve wanted to plant nasturtium on my balcony but whenever the time was right to plant the seeds I got distracted by other garden beauties. My outdoor space – and the number of my terracotta pots – is quite limited, so I have to make choices. Next year I definitely want to see these pretty edible flowers in orange, yellow and red growing up the railings but for now I’m happy when I see them at one of the markets. 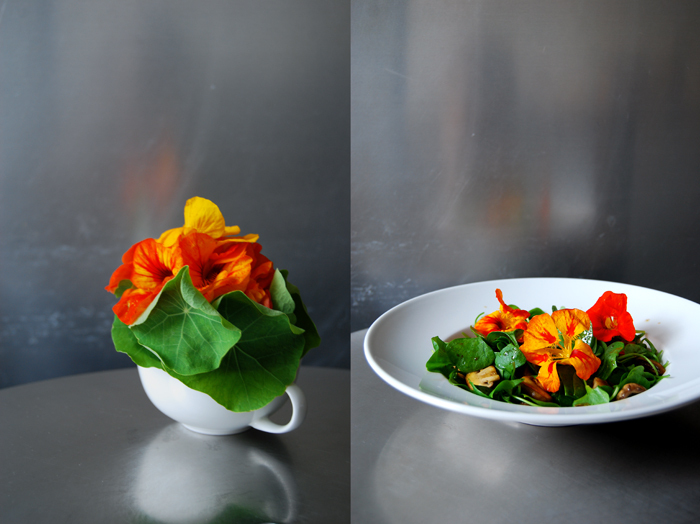 Nasturtium flowers are stunners in salads, they look quite dramatic, but apart form that, I love their delicate taste. 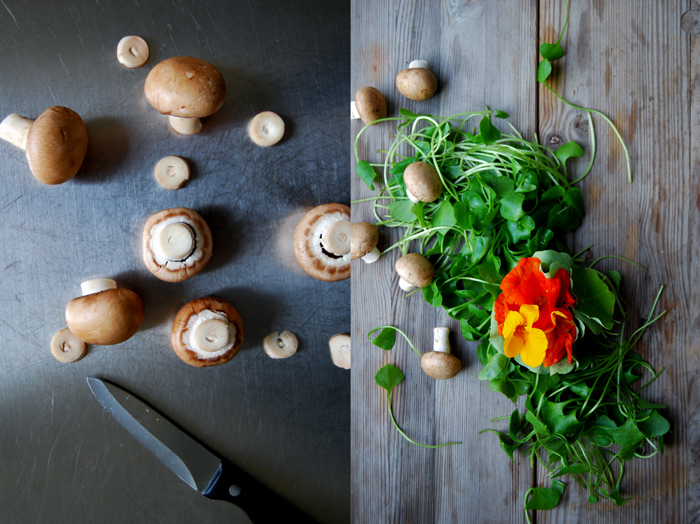 You just have to mix them with some crunchy greens and sautéed mushrooms. Thin slices of apples and a few walnuts would be nice too. 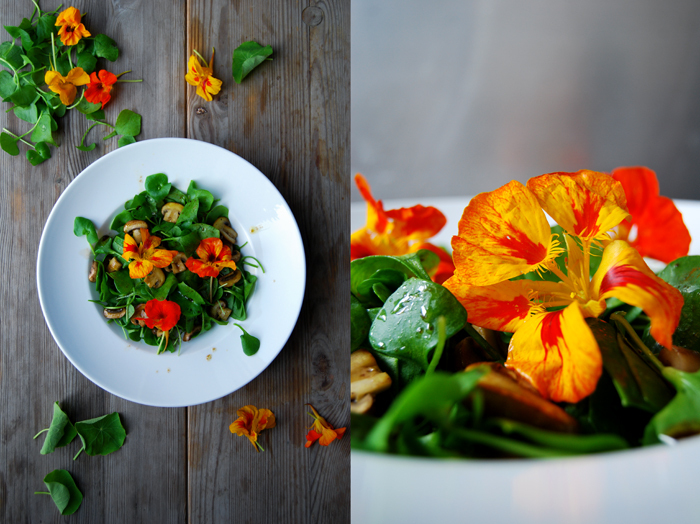 My salad turned out quite girly, as I chose the cute looking leaves of winter purslane (also known as Miner’s or Indian lettuce) which tastes quite similar to Mâche lettuce. But as long as you stay on the mild side, you can add any lettuce of your choice. 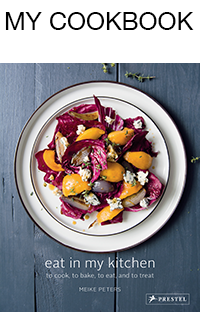 I would just avoid escarole or endive, they would be too bitter for this composition. My plate was ready within a few minutes and I enjoyed another one of my beloved, light and easy Saturday lunches before my weekend baking and cooking begins! In a pan, heat the butter and sauté the mushrooms for 2 minutes on each side until golden and still crunchy. Season with salt and pepper to taste. Whisk the olive oil and vinegar and season with salt and pepper to taste. 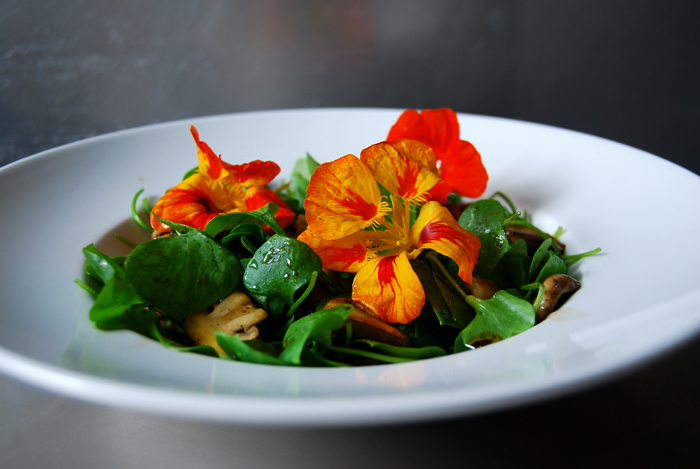 Arrange the winter purslane and the mushrooms on plates and sprinkle with the dressing. Put the flowers on top and serve immediately.